What motivates you? Fear? Reward? Love? Think about it. Anything we do can be narrowed down by these three motivators: fear, reward, and love. I hesitated going further in the Bread Baker's Apprentice book, knowing that Sourdough breads were coming up. I have never had success in making and keeping a sourdough start until now. Many people in this group have tried making sourdough starters, giving them names, and some of them haven't been successful. I now have Fear. Fear of failure. For my success I need to credit three sources: Yumarama Bread Blog, The Fresh Loaf and Of Cabbages & King Cakes. 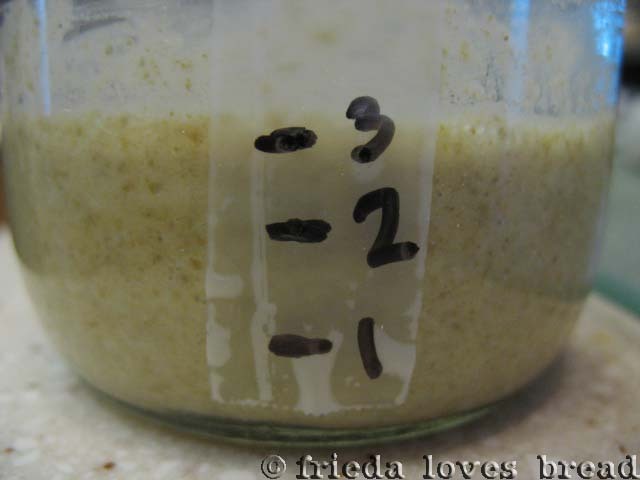 I read all their posts, all the comments, took notes and jumped right into making a wild yeast sourdough starter. From scratch. I needed motivation. Starting something new always has an element of fear and zillions of questions run through my mind, driving me crazy. Fear can be a motivator, but in this case, it stops me cold in my tracks. 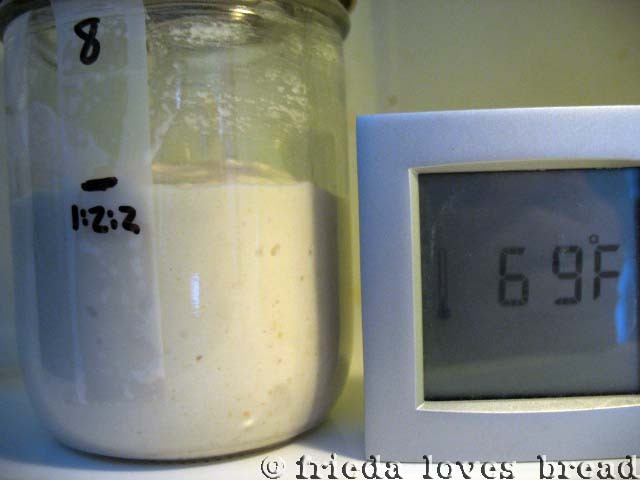 My sweet friend who got me started in making my first batch of mozzarella announced to me that she was going to make her very own sourdough starter. 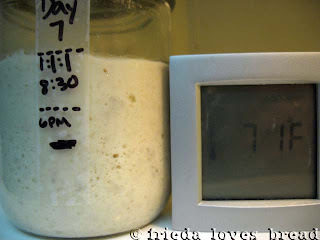 She gave me a batch of her sourdough starter, with instructions to feed it 1 cup of water and 1 cup of flour. I did exactly that and it never rose. What did I do wrong? I killed it! How? Was it too cold in my kitchen? Did I feed it enough? Not enough? I broke the news to my friend and she forgave me. She said that the bread from that particular starter made a flat bread and was going to use some from her mom that she got in a bread class. Now I needed information. 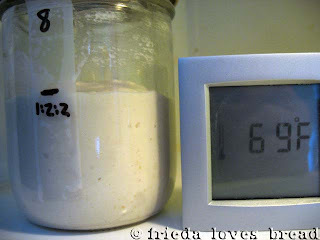 I was excited to read from the blogs mentioned above that you only needed to make a small batch of flour and water to get your starter going. You only need 1/4 c. of flour instead of a whole cup of flour. Plus, you don't waste as much starter when you discard half of it for a feeding. I read on one blog that you can use apple cider mixed in with flour to get going. I painstakingly followed all the directions for TEN days and got zilch. Nada. No rise. No bubbles. Again, I asked myself all the crazy questions and finally figured it out. I had used my homemade apple cider vinegar, which promptly killed everything before it had a chance to start! Am I a sourdough murderer? After two strikes, I was willing to give it one. More. Try. If I get three strikes, put me in bread jail and I'll never attempt this again. How hard can it be to mix flour and water? Well, if you use the flour and water method, you will get something that will smell like a dead thing around the third or fourth day. 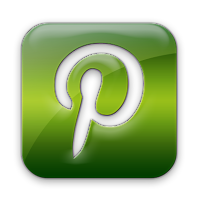 Others in blogland had more success in using pineapple juice. 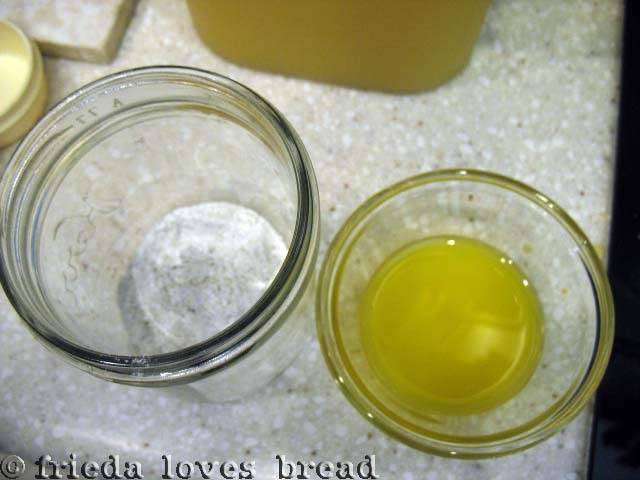 If you read Paul's posts in his Yumarama Bread blog, he compares using the flour/water and flour/pineapple juice methods. Also, I learned that the 1:1:1 ratios used are by WEIGHT. 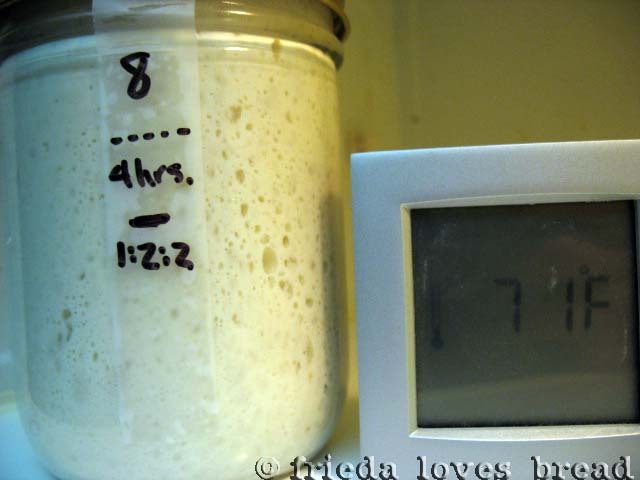 That makes a BIG difference in feeding your starter! I don't have pineapple juice, but I read another post that used orange juice. I also read that rye flour or wheat flour is the way to go. Why rye? It's like spinach for Popeye. Rye flour. Check. Orange juice. Check. Woo hoo! I'm ready to go! Day One: 2 T. rye flour + 2 T. unsweetened orange juice in a 2 pint canning jar with straight sides. Mix, scrape sides clean with a rubber spatula, cover with lid, ring, and let sit in a warm place. My oven with the light on inside worked well, as my kitchen gets cold during the night. Day Two: Add another 2 T. rye flour + 2 T. orange juice, stir, scrape sides, cover and keep warm. Day Three: Add 2 T. rye, 2 T. orange juice, stir, scrape sides, cover, keep warm. Not much activity going here. 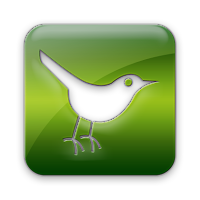 Looking like an Army green colored mass. Day Four: Time to FEED the starter. Stir down and remove 2 oz. (1/4 c.) Discard. 1/4 c. of starter should be remaining in the jar. Mix, scrape sides clean, cover, keep in warm place. Day Five: Remove half of starter (2oz. or 1/4 c.) Discard. Mix, scrape sides, cover, and keep in a warm place. Notice a pattern? Day Six & Seven: This is where I began to notice a little improvement or "rise." This was all the encouragement I needed! Then it doubled overnight. Woot! Stir down the starter. Remove and discard all but 1/4 c. of starter. 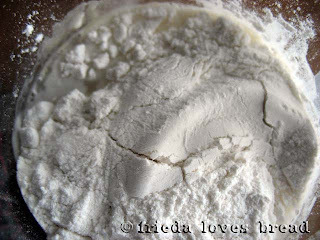 To your 1/4 c. starter, add 1/2 c. flour, 1/4 c. distilled water. This is a 1:1:1 ratio by weight. Day Eight: My starter was able to double in 8 hours or less by this time. That means it is ready to use! Woot! You will notice that this starter has a heavy pancake batter texture with the 1:1:1 ratio. I decided to boost it up and try the 1:2:2 ratio. Here is it, marked at 4 hours and at 8 hours. Wow....I'm impressed! I put this in the fridge and one week later, on Friday, it was time to feed it. I call this Friday Feed day, and it helps me remember to feed it once per week. You can go as long as every two weeks. Take out my jar of starter. Let it sit on the counter for about an hour. Stir it down, and remove half. Use the removed portion for pancakes. Let it rise till double, around 2-4 hours. Stick it back in the fridge. I'm out of the fear phase and now do it for the rewards of cooking with sourdough. I hope to morph quickly into the love phase of sourdough bread baking. 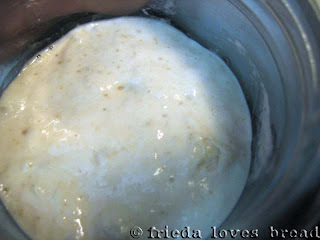 Stay tuned for my very first batch of sourdough bread and for the yummy pancake recipe! 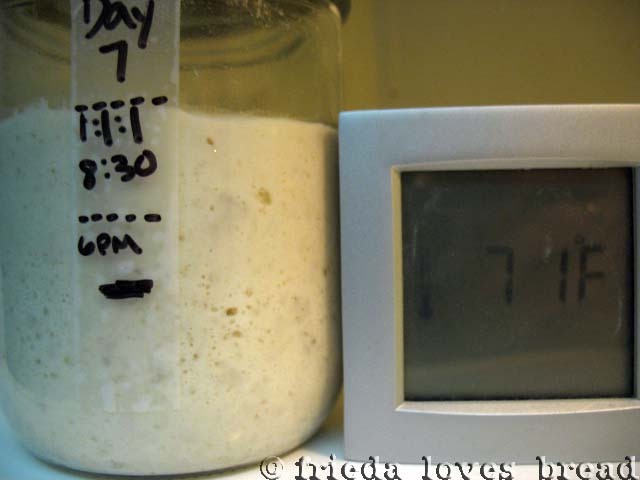 Can't wait to see the sourdough breads you make! I think this is like raising a child, or a puppy. 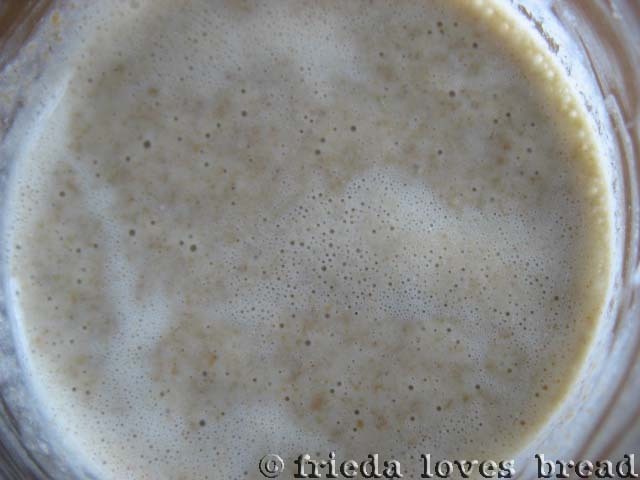 I have made breads with sponges, etc, but have never attempted wild yeast. I'm excited to learn about your success. I might have to try this again.